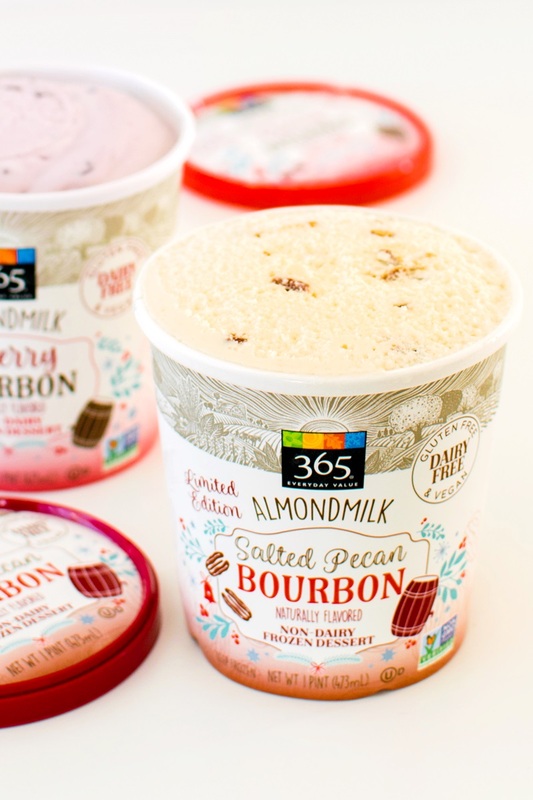 Earlier this year, we shared our list of The 10 Best Dairy-Free Ice Cream Pint Brands. That list focuses on name brands, but several grocers are now scooping up shelf space with their own store brands of dairy-free ice cream. 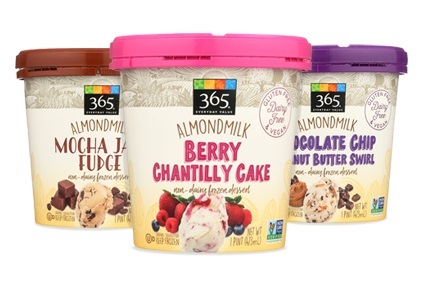 In fact, four of the grocery chains mentioned below just released their vegan, non-dairy frozen dessert line this year! And one, has a special line-up of flavors just for the holidays. If you happen to live near any of these grocers, I recommend picking up a pint or three for a taste test. Because they are store “generics” they all tend to be affordably priced! Again, this the list of store brands (“generics” specific to a store chain). 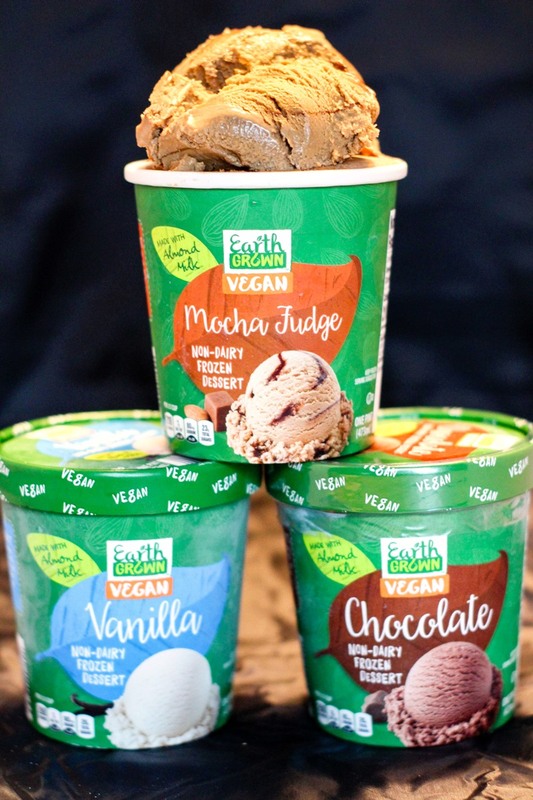 For name brands that you can find in various stores, see this post: The 10 Best Dairy-Free Ice Cream Pint Brands. All of the non-dairy products mentioned below are dairy-free by ingredients, and we believe all of their flavors are also vegan. But we couldn’t confirm each label firsthand. And as always, contact the manufacturer to discuss their production processes if a severe food allergy is a concern for you. There is always some degree of cross-contamination risk, and allergen labels (or lack of) should not be relied on exclusively. If you’ve tried any of these dairy-free ice cream store brands, leave a comment and let us know what you thought! And don’t hesitate to tell us if you find another store brand of dairy-free ice cream! Maybe you did hear about the release of Whole Foods Almondmilk line when it first launched in May. But did you know that they have seasonal holiday flavors that just popped onto shelves? These boozy (but alcohol-free) varieties are Salted Pecan Bourbon, Cherry Bourbon, and Irish Whiskey Salted Caramel. We found the Bourbon flavors, and thought they were both rather tasty with a relatively creamy but light consistency. In keeping with the grown-up theme, they aren’t too sweet, and do have a bourbon-like influence. The Salted Pecan Bourbon is a bit like a mild butter pecan ice cream that’s generously smattered with big chunks of simple, savory pecans. The Cherry Bourbon is infused with cherry flavor and dotted with firm little dark chocolate chunks. The latter flavor tasted just a smidgen “artificial” to me, but I find that many cherry ice cream flavors do. 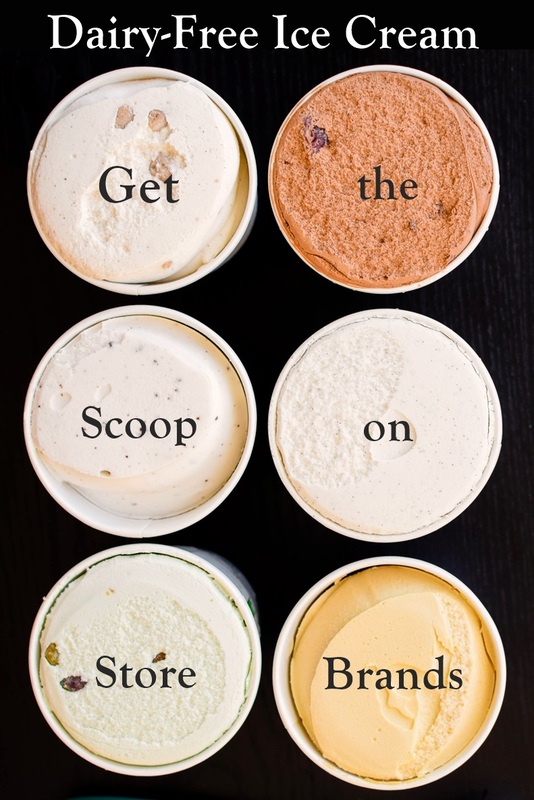 Available Flavors: Vanilla Bean, Chocolate, Berry Chantilly Cake, Mint Chocolate Chip, Chocolate Chip Peanut Butter Swirl, Coconut Almond Bliss, and Mocha Java Fudge, Salted Pecan Bourbon (winter seasonal), Cherry Bourbon (winter seasonal), and Irish Whiskey Salted Caramel (winter seasonal). Ingredient & Allergen Statement (Salted Pecan Bourbon Flavor as a Sample): almondmilk (water, almonds), organic cane sugar, organic tapioca syrup, roasted pecans (pecans, expeller pressed sunflower seed oil, sea salt), organic cold pressed virgin coconut oil, pea protein, natural flavors, carob bean gum, sunflower lecithin, gellan gum, vanilla extract. Contains tree nut (almond, pecan, coconut) ingredients. Produced in a facility that processes peanuts, other tree nuts, milk, eggs, wheat, and soy. 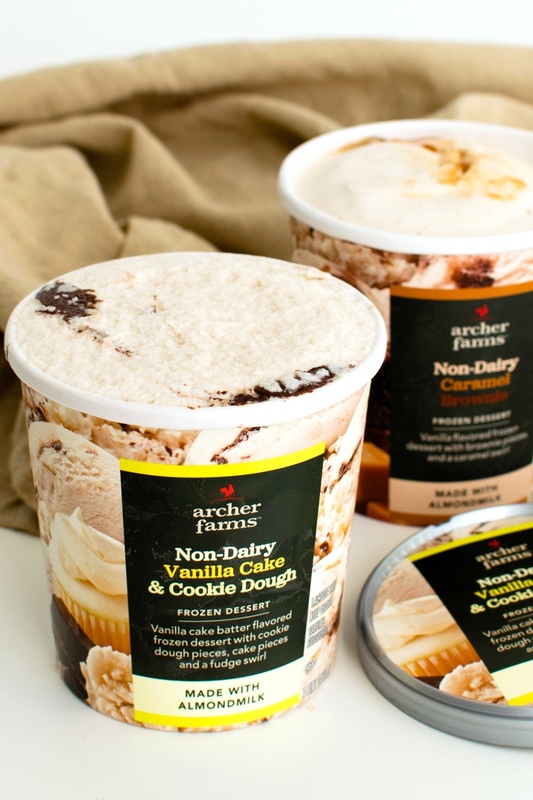 Non-GMO Verified, Certified Gluten-Free, and Certified Kosher OU-D.
Target exploded onto the non-dairy scene with not one, not three, but seven frozen dessert flavors! They’re offering classic Vanilla Bean, plus a host of uniquely creative sweet flavors. 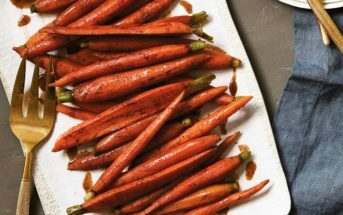 All are made with an almondmilk base, and they appear to be made without soy and carrageenan. My local Target finally stocked this store brand of dairy-free ice cream. The freezer shelf had been bare for weeks. I picked up two flavors, Vanilla Cake & Cookie Dough and Caramel Brownie. Our first thought was, “wow, these are sweet!” Tony loved them, but the were a big “like” for me. 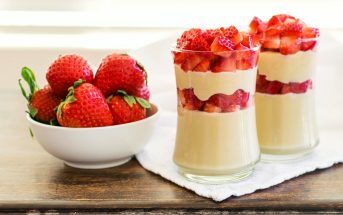 I found them a bit too sweet, and thought that the sweetness almost overwhelmed the creaminess. Nonetheless, they are tasty. The Vanilla Cake & Cookie Dough was my favorite, with HUGE chunks of chocolate and BIG balls of cookie dough throughout. The cookie dough actually provides a nice little savory-salty contrast to the ice cream (yes, the ice cream is that sweet! ), which we both thought was delicious. The Caramel Brownie is also a vanilla based, but with big pieces of brownie and a caramel swirl. Considering how generous they were with the add-ins in the Cake flavor, I was surprised by how few brownies could be found in this flavor. It was more of a caramel swirl ice cream with a few slices of semi-crunchy brownie mixed in. Ingredient & Allergen Statement (Caramel Brownie Flavor as a Sample): almondmilk (water, almonds), cane sugar, caramel (tapioca syrup, water, cane sugar, brown sugar, palm oil, fava bean protein, natural flavors, salt, pectin, sunflower lecithin), organic tapioca syrup, fudge brownie dough (dark brown sugar, organic palm fruit shortening, cane sugar, chocolate chips (cane sugar, chocolate liquor, cocoa butter, vanilla extract), rice flour, tapioca syrup, water, cocoa powder, potato flour, tapioca starch, vanilla extract, salt, guar gum, natural flavor, powdered sugar (corn free)), coconut oil, pea protein, vanilla, vanilla bean pieces, carob bean gum, gellan gum, stabilizing salts (disodium phosphate, sodium citrate), sunflower lecithin. Contains coconut and almonds. Certified Kosher OU-D. 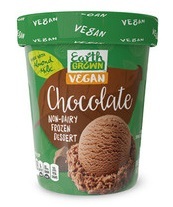 Unlike most of the other store brands, Aldi kept it simple with their vegan ice cream release. They launched in three classic flavors, first in their U.K. stores, and more recently in their U.S. stores. All three are made with an almond milk base, and also contain a little coconut oil for richness. The Chocolate and Vanilla have very pleasant milk chocolate and vanilla flavors and a smooth almond milk ice cream consistency. The Mocha Fudge has a strong coffee flavor and a nice swirl of fudge. The consistency of the Mocha Fudge frozen dessert reminds me of ice milk more than ice cream. The texture isn’t quiet as creamy as the texture of the other two flavors. Available Flavors: Vanilla, Chocolate, and Mocha Fudge. Ingredient & Allergen Statement (Chocolate Flavor as a Sample): almond milk (water, almonds), cane sugar, organic tapioca syrup, organic virgin cold pressed coconut oil, high fat cocoa powder processed with alkali, pea protein, natural flavor, carob bean gum, gellan gum, and sunflower lecithin. Contains: almond, coconut. Certified Kosher OU-D. Trader Joe’s Photos by PETA. This one is old news, but it’s certainly worth mentioning. Especially since Trader Joe’s has kept these non-dairy frozen desserts around for quite some time. 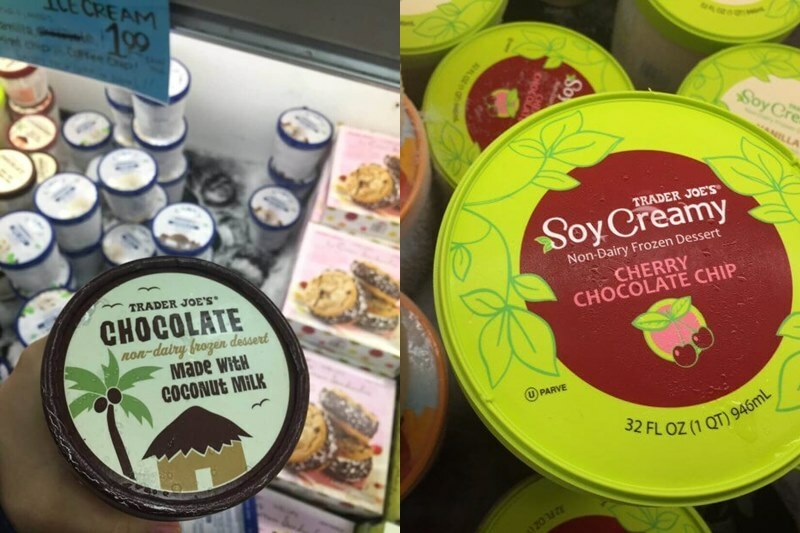 They offer two soy-based “Soy Creamy” pints and one (formerly two) coconut-based “Made with Coconut Milk” pints. All three are staples for many households since they do have a a very creamy mouthfeel. But I would stick to your food preferences. 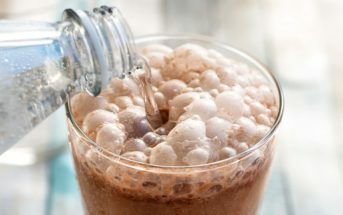 The Soy Creamy does have a slight beany aftertaste (like most soy-based alternatives) and the Made with Coconut Milk does assert itself just a bit in the chocolate flavor. 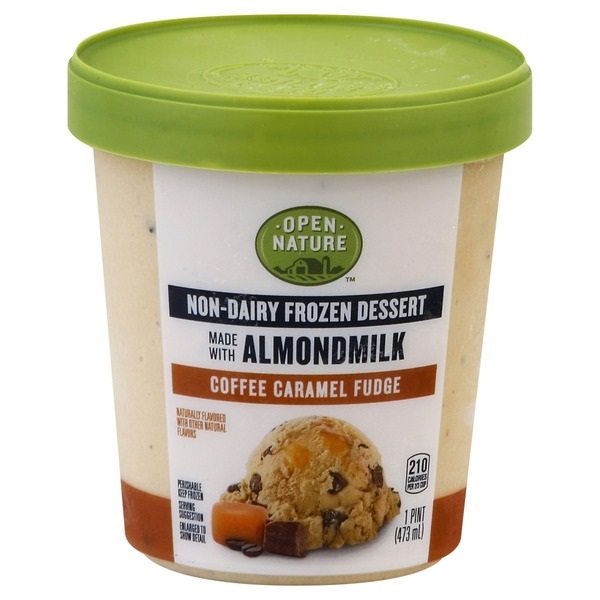 And all of the Trader Joe’s Non-Dairy Frozen Desserts contain carrageenan, which could be a sticking point for many people. 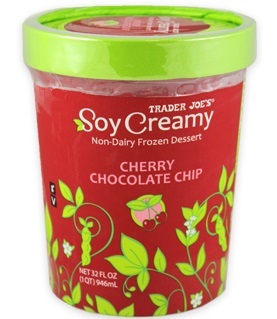 Available Flavors: Vanilla and Chocolate Cherry Chip Soy Creamy. Chocolate Made with Coconut Milk. Ingredient & Allergen Statement (Vanilla Soy Creamy as a Sample): organic soymilk (filtered water, organic soybeans), organic crystallized cane sugar, oleic safflower oil, brown rice syrup solids, natural flavors, carob bean gum, guar gum, carrageenan, organic vanilla extract. Contains soy. Certified Kosher Parve. Ingredient & Allergen Statement (Chocolate Made with Coconut Milk): coconut milk, water, sugar, cocoa powder, corn maltodextrin, dextrose monohydrate, mono and diglycerides of fatty acids, locust bean gum, guar gum, carrageenan, salt. 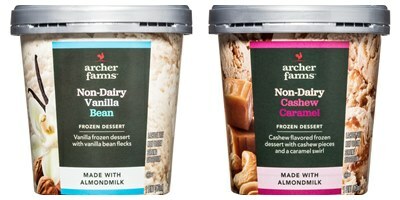 And last, but certainly not least, Albertsons (a grocery chain that now owns the Safeway grocery stores) has launched seven flavors of dairy-free frozen dessert. Three of them are made with a cashew milk base and four have an almond milk base. 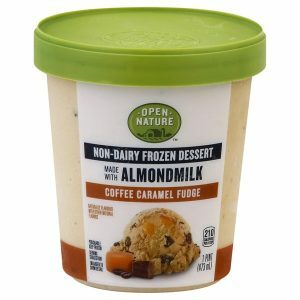 Open Nature is the store’s “health and wellness” brand – a term that I think is loosely used since we are talking about ice cream here! We haven’t tried it yet, but will update as soon as we do! Share your opinion in the comments if you have tried it. Available Flavors: Peanut Butter & Cookies, Chocolate Fudge Brownies, Coffee Caramel Fudge, and Banana Walnut Fudge with an almond milk base and Vanilla Bean, Cookie Dough, and Salted Caramel Cluster in a cashew milk base. Ingredient & Allergen Statement (Coffee Caramel Fudge Flavor as a Sample): almondmilk (water, almonds), caramel swirl (sugar, water, coconut oil, corn starch, pectin), sugar, tapioca syrup, fudge pieces (sugar, coconut oil, cocoa processed with alkali, peanut oil, cocoa, natural flavor, soy lecithin), sunflower oil, contains 2% or less of: coffee extract, rice flour, potato starch, sunflower lecithin, locust bean gum, guar gum, salt. Contains: soy, peanuts, tree nuts (almonds). May contain: wheat, eggs, tree nuts (pecans, hazelnuts, pistachios, cashews, coconuts, walnuts). For More Dairy-Free Living Ideas, Get Go Dairy Free! Trader Joes still has both the chocolate and strawberry made with coconut milk ice cream options. I purchased some about a week ago. Thanks for posting I will be looking for these options! Fabulous, thank you for sharing this! My local TJ’s doesn’t have both options.